Summer is the perfect season to enjoy some of the finer restaurants in more leafy settings. From where the Delaware River rises in New York State, until it flows into the Delaware Bay, it can move with torrential force or slide gently along its banks. Gentle is how it looks from a window at Odette's, one of New Hope�s landmark restaurants. Built in 1794 as a tavern for river boatmen, it still retains historic warmth, with dark wooden floors, beams and stone fireplaces. In the 1960s, it became a busy nightspot owned by Odette Myrtil Logan, a French actress, and it was a watering spot for many celebrities who appeared at the nearby Bucks County Playhouse. It is now run by the Barbone family, and some of the old joie de vivre of Odette has come back in their justifiably celebrated cabaret nights. 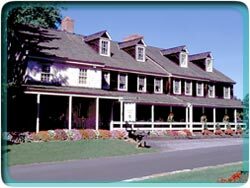 As the weather warms, contemplate a day in New Hope, then a drink and dinner at Odette's, and stay for the show. One clearly does not come here for a great gourmet experience, but the attentive young waitresses who attend to you as the placid river slips by, and the promise of a first-rate little show done by someone famous or until then, unknown, can be all the impetus you need. Ed Rendell, Mike Fisher, guard the ballot box � here come the real Governors. 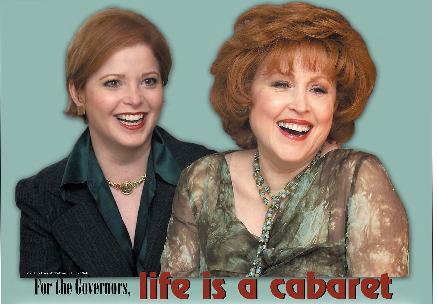 These Governors � Mom Deborajane and daughter Jennifer � elect to perform for their public on stage, which they will do next month at Act II Playhouse in Ambler. The Jewish mother-daughter duo of Deborajane and Jennifer Governor elect to take their vows outside the state capital, however. The area residents are more interested in performing than politics; and Ambler, not Harrisburg, is where this singing duo is setting the stage for their act. It will all be spotlighted the evening of Nov. 16 at Act II Playhouse of Ambler, which is getting into the cabaret act by presenting a twosome almost too good to be true � Deborajane and Jennifer were named �Most Beautiful Mother and Daughter� on the Sally Jesse Raphael television show some years back. At least she knows where one of them is: A grad of the prestigious National Theatre Institute of the O�Neill Theater Center in Connecticut, Jennifer also appeared on the same soap and has since cleaned up in her day job � the Villanova University Law School grad is an attorney for Blank, Rome, Comisky and McCauley. The Jewish Judds? �That�s a good way of putting it,� says Jennifer Platzkere Governor of the mom-daughter duo she�s doing on stage at New Hope�s Odette�s on Mother�s Day. It�s the perfect gift a daughter can give � stage presence. Especially when both performers are show-biz veterans. In later years, she sought the umbrella coverage that a career change could offer, earning a law degree. Now an associate in the labor department of Blank Rome Comisky & McCauley LLP, Jennifer enjoys the dynamics of her split decision: practicing law and rehearsing for her upcoming concert. There�s a song in their heart and their heart in the song. But, mother, daughter ... in front of one mirror? Isn�t this too daring a duet? �We�ve performed a few times at area clubs over the past three or four years,� says Jennifer. Enter laughing � and singing � with numbers about their lives together, some focusing on �how I�m not married and, for her, the agita of being a Jewish mother,� jests Jennifer of the Broadway tunes and �obscure comedy numbers� they�ll perform at Odette�s. A show only a mother could love? No, it�s so much more than that. And the two have proved how attractive an act they can be: They were voted �Most Beautiful Mother and Daughter� on a 1992 Sally Jesse Raphael Show talent show � coming up winners on a show otherwise known for life�s losers. Mom and daughter haven�t lost a step � or note � since. It�s all a labor of love for the labor lawyer, whose clients include the Jewish Exponent, and her mother. And love�s labor is not lost on the Momma, either. �I only want her to realize her dreams,� she says of Jennifer. �Well,� says the Mom, �I may nag a little � and I make good chicken soup.� Can the stereotypes; they�re cooking on stage at Odette�s. Reviews of Classic Theatre's "Jacques Brel"
You wonder whether, when he authorized the musical revue Jacques Brel Is Alive and Well and Living in Paris, the Belgian-born Brel had any idea that the show would still be performed in America 35 years later. Judging from the realistic, no-illusions, who-can understand-life? attitude that the writer-singer's songs suggest, you have to think not - that in the Great Beyond (Brel died in 1978 at age 48) he would greet news of the show's longevity with a shake of the head and a Gallic shrug. Go to the sound revival of Jacques Brel at the Playground at the Adrienne, and you'll appreciate why this revue continues to be staged. One reason is that a sizable audience remains for it among those who apparently became familiar with Brel songs during his heyday in the 1960s and '70s, and who want the opportunity to revisit them. I say this because Thursday's nearly sold-out performance was attended largely by folks of a certain age (speaking as one of them myself) who seemed to be familiar with the show and responded enthusiastically to it, particularly when such well-known songs as "Sons Of," "Carousel" and "The Desperate Ones" were well done. I would guess, too, that singers desire to do the show and get satisfaction from it. At any rate, the four here - Rene Goodwin, Jennifer Governor, Zebediah K. Homison and John O'Hara - appear to be relishing the challenge of effectively presenting the musically complicated, lyrically rich story-songs. Not every performance of the 21 numbers is fully successful, but when the show hits its stride after a somewhat tentative start, the musical, narrative and emotional content of most numbers is effectively conveyed. All of the performers have good voices and they enunciate clearly, which is important with Brel, whose lyrics must be heard. Director Barry Brait and musical director Ed Hagopian have done a good job of matching the numbers to the vocal abilities and personalities of the cast members. Brait, however, relies almost entirely on the singers to present the songs, and there are numbers that could use the help of at least some staging and the more-than-rudimentary lighting available in the Playground space. The director and singers could also work at creating a closer feeling of ensemble to give the production a needed continuity and a deeper sense of connection to the audience. All in all, though, Jacques Brel, again, is alive and doing well in Philadelphia. are so genuine and vital. Zebediah K. Homison, John O�Hara, and Merion�s Jennifer Governor. The quartet sing five ensemble numbers, including the famous finale, �If We Only Have Love,� but most of Brel consists of heartfelt solos, each one a tiny, fascinating play. If you enjoy the musicals of Stephen Sondheim, you�ll appreciate Brel. While many Brel productions try to link songs with staging � as if the songs needed to be mined as well as sung � Brait's, simple, scaled-down approach complemented by Shannon Zura�s lighting, allows the song and the singers to shine. In a time when songs seem cut from patterns and mass-produced, Brel is a refreshing reminder of a composer�s powerful art..
chic (think Belmondo on a motorcycle). A decade later two producers -- Eric Blau and Mort Shuman -- took the chance that Brel would prove equally popular in America. They translated a number of Brel songs into English, and fused them into an extended revue for four performers, calling it Jacques Brel is Alive and Well and Living in Paris. But would the material, which even in the vernacular retained its distinctly continental flavor, appeal to New Yorkers? Bien sur. Jacques Brel was a smash hit, chalking up more than 1,800 performances at The Village Gate. I had thought Jacques Brel more or less gone for good. So imagine my surprise to find a 35th anniversary revival right here in Philly. I approached it with both nostalgia and trepidation. How would it all work now? Pretty much like it always did. The more melodramatic pieces ("Next," "Amsterdam") feel dated, but the best songs ("Carousel," "If We Only Have Love," "Sons Of") retain their individuality and charm. There's not much binding together Jacques Brel, but it has a nice sense of forward momentum, and (at 90 minutes) doesn't overstay its welcome. Part of the show's success is that it's always worked with all kinds of different performers: the more motley the crew, the better. You don't need a great voice to sing Brel, and you don't need to be a great actor. What you need is enthusiasm, sincerity and performance savvy, and the four singers in Classic Theatre Productions' show -- Rene Goodwin, Jennifer Governor, Zebediah Homison and John O'Hara -- all score the requisite points. Barry Brait wisely directs for speed and fluidity. He makes the single mistake of overstaging "Funeral Tango," but mostly keeps things elegantly simple. Ed Hagopian (on piano) and Robert Smith (percussion) provide fine support. What was most pleasing about it all was the audience. On a stifling Sunday in August, the Adrienne was packed to capacity with a crowd that enthusiastically hung on every moment. For them, at least, the material clearly retains its magic. Maybe it will for you too. In any event, the CTP presentation is more than adequate for those wishing to discover -- or revisit -- the Brel phenomenon.